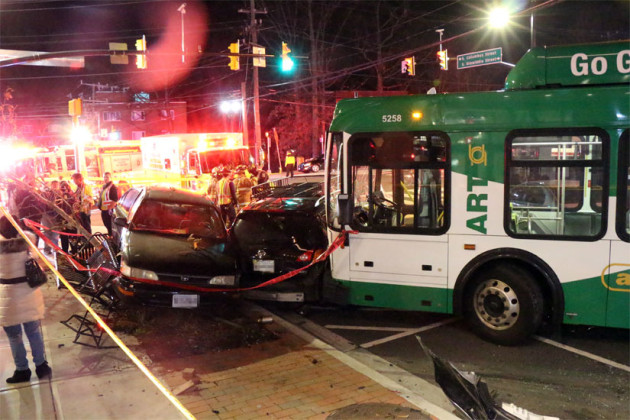 Seven vehicles — five cars, an ART bus and a mixing truck — were involved in a collision at about 5:45 p.m. at the intersection of Columbia Pike and S. Dinwiddie Street. According to Arlington County Police Department spokesman Lt. Kip Malcolm, the ART bus was in the parking lot of Columbia Pike Plaza when a car turned in front of it. The ART bus, driven by 26-year-old Agere Sileshi, struck the car, at which point Sileshi lost control of the bus, Malcolm said. The bus pushed the car into a parked vehicle, Sileshi accelerated and pushed all three vehicles over the brick retaining wall and onto S. Dinwiddie Street, Malcolm said. There, the bus hit three cars stopped at a red light, creating another chain reaction in which the seventh vehicle, a parked car, was pushed into benches and a tree on the sidewalk in front of Arlington Mill Community Center. Westbound Columbia Pike was closed for more than an hour around the scene as emergency crews from Arlington and Fairfax sort out the aftermath, which included cars strewn all over the intersection and a substantial part of the brick wall along Dinwiddie Street destroyed. In addition to the cars and walls damaged, several bicycles parked in front of Arlington Mill Community Center were damaged in the accident, and at least two benches affixed to the ground were either destroyed or displaced. If you have fallen victim to an accident such as this one call 1-800-260-2577 for a free consultation. You may be entitled to financial compensation!